The color of the objects created by a plotting function can be specified explicitly using the ‘color’ keyword argument of the function. This color is then applied uniformly to all the objects created. If you want to vary the color across your visualization, you need to specify scalar information for each data point. Some functions try to guess this information: these scalars default to the norm of the vectors, for functions with vectors, or to the z elevation for functions where it is meaningful, such as surf() or barchart(). The easiest way to choose the colormap, most adapted to your visualization is to use the GUI (as described in the next paragraph). The dialog to set the colormap can be found in the Colors and legends node. To use a custom-defined colormap, for the time being, you need to write specific code, as show in Custom colormap example. The scalar information can also be displayed in many different ways. For instance it can be used to adjust the size of glyphs positioned at the data points. This behavior gives visible points for all datasets, but may not be desired if the scalar represents the size of the glyphs in the same unit as the positions specified. There are many more ways to represent the scalar or vector information attached to the data. For instance, scalar data can be ‘warped’ into a displacement, e.g. using a WarpScalar filter, or the norm of scalar data can be extracted to a scalar component that can be visualized using iso-surfaces with the ExtractVectorNorm filter. You may want to display color related to one scalar quantity while using a second for the iso-contours, or the elevation. This is possible but requires a bit of work: see Atomic orbital example. Each mlab function takes an extent keyword argument, that allows to set its (x, y, z) extents. This give both control on the scaling in the different directions and the displacement of the center. Beware that when you are using this functionality, it can be useful to pass the same extents to other modules visualizing the same data. If you don’t, they will not share the same displacement and scale. The surf(), contour_surf(), and barchart() functions, which display 2D arrays by converting the values in height, also take a warp_scale parameter, to control the vertical scaling. 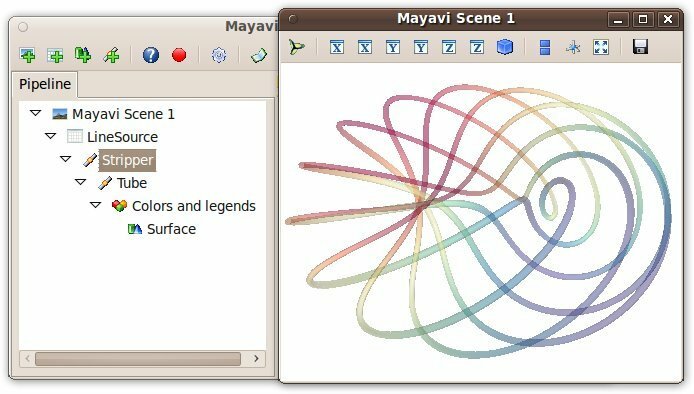 Mayavi, and thus mlab, allows you to interactively modify your visualization. The Mayavi pipeline tree can be displayed by clicking on the mayavi icon in the figure’s toolbar, or by using show_pipeline() mlab command. One can now change the visualization using this dialog by double-clicking on each object to edit its properties, as described in other parts of this manual, or add new modules or filters by using this icons on the pipeline, or through the right-click menus on the objects in the pipeline. A very useful feature of this dialog can be found by pressing the red round button of the toolbar of the pipeline view. This opens up a recorder that tracks the changes made interactively to the visualization via the dialogs, and generates valid lines of Python code. To find out about navigating through a program in the pipeline, see Organisation of Mayavi visualizations: the pipeline. In addition, for every object returned by a mlab function, this_object.edit_traits() brings up a dialog that can be used to interactively edit the object’s properties. If the dialog doesn’t show up when you enter this command, please see Running mlab scripts. This will give you the full-fledged UI instead of the default simple window. If you publish articles using Mayavi, please cite Mayavi. We need these citations to justify time and resources on the software. © Copyright 2008-2018, Enthought Inc.. Last updated on Sep 02, 2018. Created using Sphinx 1.5.5.